A beautiful and inspiring new documentary by the BBC about the life, passion, and work of A. W. N. Pugin, who spearheaded the Gothic Revival and changed the face of Britain's cities, is currently available online on the BBC iPlayer until 31 January. What struck me most about this presentation of Pugin was the consuming passion and vision of this young man, who wrote his first treatise 'Contrasts' at the age of 21, and whose second book on the 'Principles of Pointed Architecture' re-iterated his belief that the honesty of Gothic architecture would reform the morals of Britain. His writing was so engaging and convincing, and his designs so captivating that Pugin influenced a generation of Victorian architects. Indeed, it is argued that his principles of honest architecture, suited to the human person and encompassing every detail, continues to inspire the work of modern British architects such as Norman Foster. 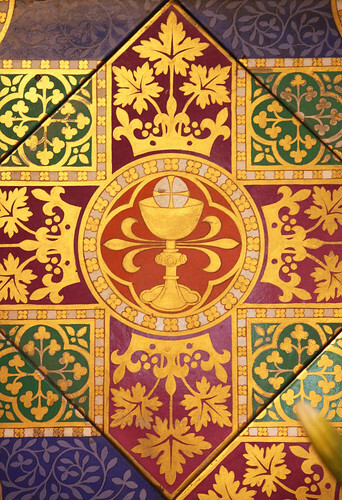 Of particular liturgical interest, apart from the churches such as Cheadle which feature in this documentary, is some footage from High Mass celebrated in the Extraordinary Form at the Pugin designed St Mary's Cathedral in Newcastle. The celebrant on that occasion was Fr Michael Brown, who blogs here.